Need compressed, liquid and various mixtures of hydrogen (H2)? The Aerospace and Shipbuilding industries use hydrogen for metal sintering and annealing. The Food & Agriculture industries use hydrogen as cryogenic agent in cooling, chilling and food freezing. Please see the table below for information and to access safety data sheets on hydrogen available from WestAir. The Oil and Gas industries often uses hydrogen to upgrade heavy crude oils into refined fuels, and help to meet transportation fuel specifications. 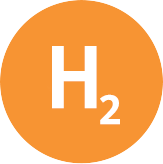 Hydrogen can also be used to de-sulphurize fuels, to heat-treat metals, and to test for leaks. The Metal Fabrication industry often mixes hydrogen with argon as a shielding gas for TIG and plasma welding of stainless steel. Hydrogen can also be combined with oxygen for underwater flame-cutting. We deliver gaseous and compressed hydrogen in a variety of cylinders, vessels and containers to fit your precise application needs.